Lisson Gallery is pleased to welcome a new exhibition by Berlin-based artist Ceal Floyer, her sixth with the gallery since she first showed in the same spaces in 1997. Over 20 years on, Floyer has lost none of her defiant simplicity or piercing philosophical precision, producing a distinct body of sculptural works, featuring poetic situations, subtle interventions, as well as new video and light installations. A sonic experience beneath a clear, parabolic dome, which contains a directional speaker, hung from the ceiling, briefly drenches visitors with a gushing loop of static sound. While Untitled (Static) could be a strangely meditative zone of white noise, within the already white confines of the gallery, it might also act as an approximation of the sound of rain atop an umbrella, creating a momentary trompe l’oreille (the aural equivalent of a trompe l’œil). 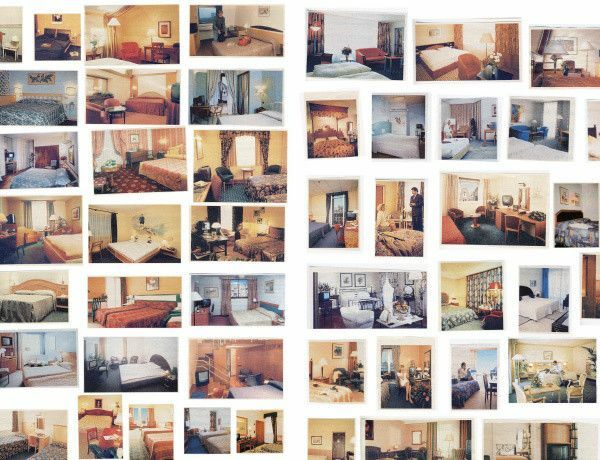 Elsewhere, a diptych montage of small-sized images of Hotel Rooms (all works 2018) culled from travel brochures and glossy magazines advertising hotel suites and interior décor, is hung on two adjacent walls. This travelogue of pristine lodgings bespeaks not so much Floyer’s predilection for ironic image appropriation as it deconstructs some of the hidden conventions of commercial photography: each vista of a freshly made-up double- or twin-bedded haven is shot from either a left-hand or right-hand point of view. Floyer proceeds to uncannily mirror and re-stage the angle of the camera in a literal way by categorising and placing each image on either the left- or right-hand side of the space. An understated survey of what constitutes the boundaries of this exhibition continues on the window where two typical hazard signs depict the maximum headroom available both inside and outside, although the extreme unlikelihood of anyone transgressing the height restrictions render these warnings as merely conceptual in nature. Multiple versions of this work, Maximum Headroom (2014/2018), will be adorning the façade of the Neuer Berliner Kunstverein until next year, further expanding (rather than limiting) where in time or space Floyer’s suggestions can exist or operate. The function or lack thereof in Floyer’s subversive statements is compounded both by their ubiquity in everyday life and by their absurdity in her hands. As if to ram this point home, the main gallery features an outsized video, Hammer and Nail, of a hammer violently pounding a nail into a board. The progress of metal into wood seems stunted by the movement of the entire filmic frame, which gradually comes up to meet the nail’s head with each blow, enacting a negation of duties and a structural reversal or complication of the usual hammer-meets-nail relationship. Riven through, as these pieces all are, with Floyer’s inimitable humour and rigour, it is no surprise that she has been included in the South London Gallery’s current group exhibition, ‘KNOCK, KNOCK: Humour in Contemporary Art’ (until 18 November).